Cigarette smoking could pose additional health risks to people who are obese, a new animal lab study suggests. Researchers from the Pacific Northwest National Laboratory found that cigarette smoke could affect metabolism — including the metabolism of prescription drugs — and also has the potential to be more carcinogenic for the obese than the non-obese. These findings are based on lung and liver tissues from obese and lean mice that were either not exposed to smoke, that were exposed to direct cigarette smoke, or that were exposed to secondhand smoke. Even though the new study was only conducted on mouse tissue in a lab setting, past research has shown that cigarette smoke can have an effect on activity of a type of enzyme, called P450, by making the enzymes more active. P450 enzymes are responsible for breaking down the majority of drugs and other substances, and also metabolize fat. 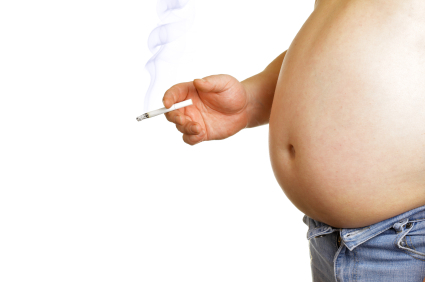 The new study showed that while obesity didn’t seem to factor into cigarette smoke’s effects on some of the P450 enzymes’ activity, “for other enzymes, which usually are far more active when exposed to cigarette smoke, the addition of obesity had a dramatic, opposite effect. The enzymes were 100 times less active,” Wright said in the statement. This, in turn, has the potential to lead to a greater lung cancer risk. Meanwhile, secondhand smoke seemed to increase some enzymes’ activity, compared with direct cigarette smoke. The findings were presented at the annual meeting of the American Chemical Society; because they have yet to be published in a peer-reviewed journal, they should be considered preliminary. Indeed, researchers noted that more research is needed to find what cigarette smoking coupled with obesity can do to human health, and not just in mouse tissue in a lab setting.